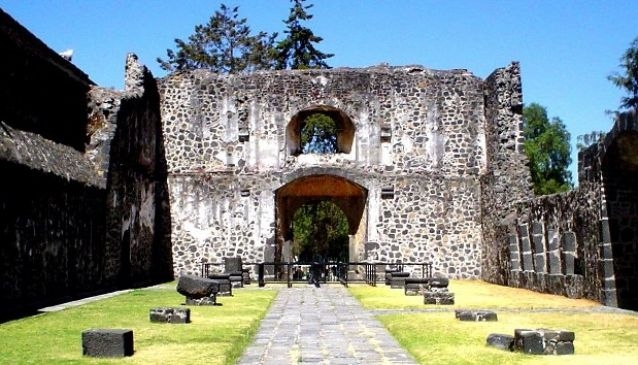 In the early eighties (1983), programs and projects for the rescue of the historic center of Culhuacán area were created; transforming the environment of the former convent. The venue was opened in February 1984 and nine years later, the Museum site was created with pre-Hispanic and colonial artifacts found in the excavation and donations from villagers. Former Convent Culhuacán known as Culhuacán Community Center has six showrooms. The rooms are located in the upper cloister, was guarding deities such as the goddess of corn cobs or Chicomecóatl (seven snakes); a mask of Tlaloc , god of rain; showing the rich culture of the ancient Culhuacans. Besides the colonial era is illustrated with meaningful objects that evoke the work of the monks evangelized, as baptism record books of the sixteenth and seventeenth centuries, four columns of altar and pulpit base that decorated the original church is also shown.